Pulse until the mixture starts to crumble, 12 to 16 pulses, then add the remaining flour and pulse until the mixture resembles coarse sand, about 8 more pulses. Transfer the crumbly dough back to the original bowl. Sprinkle in the ice water, 1 tablespoon at a time, and use a rubber spatula to fold and form the dough until it sticks together in a cohesive ball. Knead the dough a few times to get it to come together in a smooth ball, but be careful not to overwork it. Form the dough into a 1-inch thick disk, wrap it in plastic wrap, and chill for 30 minutes. Place the chilled dough onto a lightly-floured surface, or floured parchment paper. Roll the dough into a 7-inch circle, then flip and dust your surface with a bit more flour before placing it back down. Continue to roll into a 12-inch circle. If the dough is too firm, let it sit for 10 minutes at room temperature. If its too sticky, add more flour. If the dough cracks, patch it and continue rolling. Gently transfer the dough to a 9-inch pie plate. Trim the overhanging to about inch, then tuck it under and crimp the edges with your fingers.Lightly cover the pie crust and chill for 30 minutes while you make the crumble topping and filling.For the crumble topping: In a food processor, pulse together the flour, oats, brown sugar, salt, cinnamon, and spice until combined. Add the coconut oil and pulse until crumbly. If it's too dry, add cold water 1 tablespoon at a time until larger crumbles form. Set aside.For the filling: Preheat the oven to 375F.In a large bowl, combine the apples with the lemon juice, vanilla, maple syrup, and cornstarch and toss well to coat. 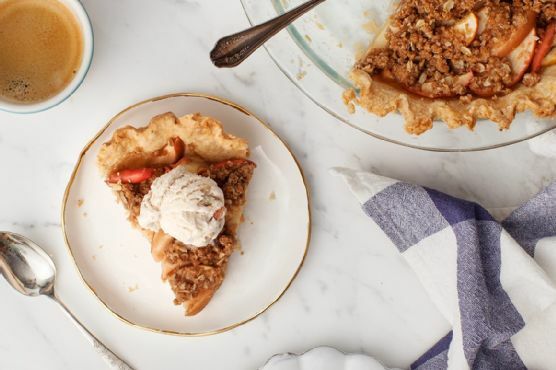 (You could also add a few more pinches of cinnamon, if desired)Fill the pie crust with the apple mixture and sprinkle evenly with the crumble topping. Bake for 30 minutes and then lightly cover with foil and rotate the pan in the oven. Bake 15 to 20 more minutes or until the apples are tender and the crust is golden brown.Cool 1 hour at room temperature before serving. Crumble Pie works really well with Lambrusco Dolce, Late Harvest Riesling, and Vin Santo. These wines are all sweet, which is important since wine should usually be sweeter than the food you're pairing with it.